I believe this is the only Jabba-related Micro Machines item that I didn’t have, and the Jabba figure it includes may be the only commercially available Jabba figure that wasn’t in my collection. Obviously it’s based on the podrace scene from Star Wars: Episode 1, where Jabba makes a brief appearance. Other Jabba-related items based on this scene include the Spitting Jabba the Hutt & 2-Headed Announcer figure (for which I have some design documents and concept drawings) and the “Jabba Presents Podracing” T-shirt. As far as I know, the Jabba in this set is the smallest Jabba figure ever commercially produced. At about 2cm long, it’s just a bit smaller than the one included with the Micro Machines Jabba mini-head. However, it’s much plainer than most Micro Machines figures. They generally have some reasonably good paint work on them despite their small size, but this one is just cast in green plastic. He fits onto a little throne with a gong (used to start the race), which pops out of an alcove at the push of a button. Compared to many of the other Micro Machines sets, this one is a bit on the boring side. There are a number of things that move in various ways, such as audience members that pop up when you push a button, etc. 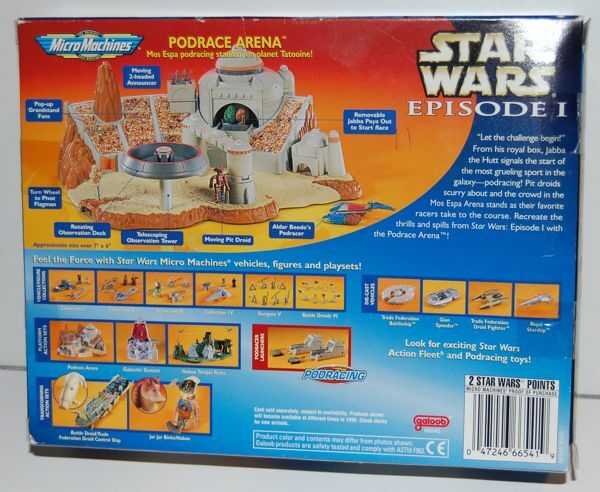 But it’s a podrace playset that only comes with a single podracer, so you can’t even have a race! There’s only so many times you can pretend to have Jabba start the race before it gets a little old. My son had to make extra podracers out of LEGOs. 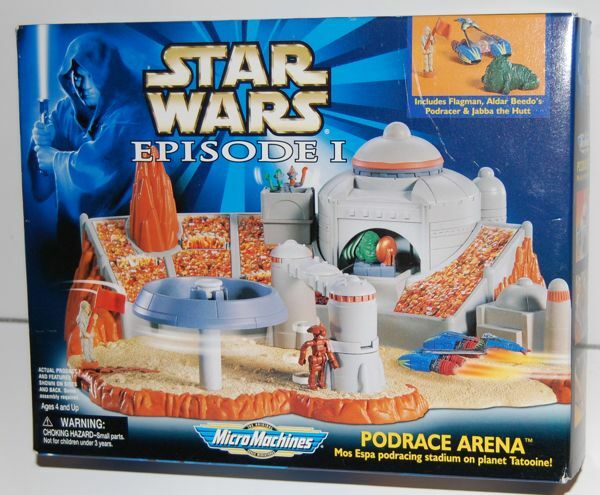 I used to love collecting the Micromachines playsets as i always felt that there was so much thought put into them. The plural of LEGO is the same as the singular. “My son had to make extra podracers out of LEGO”. Love this site. Keep up the great collecting. I’m aware that some people apparently feel very strongly about not pluralizing the word LEGO but in my opinion it’s fine as a colloquialism. In fact using LEGO as a universal plural sounds odd in many cases. LEGO the company, for its part, apparently wants us to say neither — suggesting LEGO bricks or LEGO sets instead.